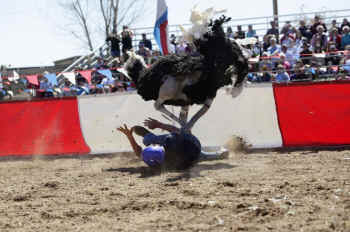 From March 13th – 15th, approximately 300,000 people will travel to Chandler, Arizona, to watch ostriches being abused and exploited during the city’s annual Ostrich Festival. 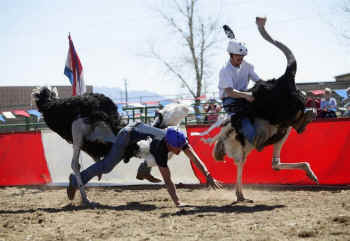 For three days, jockeys will climb onto the backs of ostriches; grab them by their wings and feathers; and force them to run around a track in front of cheering spectators. They will also hook the birds up to chariots to race them. Sign the Change.org petition created by Phoenix activist Tina Riedel demanding that the Chandler Chamber of Commerce and Universal Fairs Stop Using Ostriches for Entertainment. The company that produces the festival, Universal Fairs, describes it as a “family event.” In addition to ostrich racing, the festival offers carnival rides, entertainment and “spectacular food,” including ostrich burgers and jerky. Also on sale at the festival are ostrich leather products, hand-painted ostrich eggs, and dusters made from ostrich feathers. 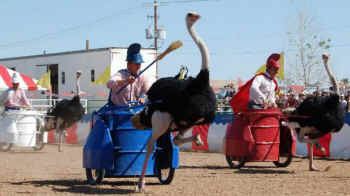 Can the ostriches forced to race smell their friends being cooked? For more information about Ostriches and Emus, who are members of the oldest living family of birds on earth, known as ratites, or flightless fowl, please visit United Poultry Concern (UPC) page on Ostriches & Emus.